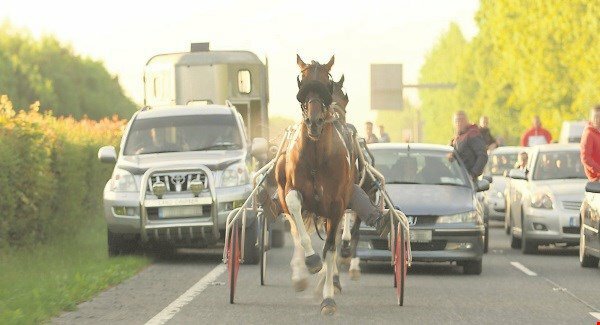 The Mayor of Limerick City and County Council has called for a nationwide ban on sulky racing. Councillor Kieran O’Hanlon made the call after a recent sulky race showing cars being forced into ditches on a Limerick road was recorded and uploaded to YouTube. “To me it’s giving the two fingers to the whole population and the owners of the sulkies will do what they like when they like. I think this is a matter for legislation, it’s an absolute disgrace and totally unacceptable,” said the Limerick Mayor. In 2015 Kilkenny city and county were the first county to pass a by-law to ban sulky racing on public roads and Fianna Fail Cllr Andrew McGuinness said sulky racing has decreased because of the ban. “I did it during my term as Mayor of Kilkenny it gave me a platform to publicly discuss an issue that had plagued and terrorised Kilkenny for years and it had gotten completely out of hand where horses were turning up dead on the side of the roads. “I put a motion down banning sulky racing and it was passed unanimously and I would like to see Limerick do the same and have it stamped out completely,” said Cllr McGuinness. The Limerick Voice can reveal that Cllr Kieran O’Hanlon is planning to put forward a similar motion. “I think councillors and the Government have to take action on this. I am willing to sit down with An Garda Siochana to put a consultation process in place and I’m sure the Gardai would be happy to sit down and see how we can resolve it. If we can do anything I certainly would be encouraging the council to ban sulky racing,” he said. The Mayor is also concerned about the welfare and cruelty to the animals. Limerick Animal Welfare has seen numerous cases of abuse to horses because of sulky races. Children as young as 10 years old have been seen racing horses on public roads. “It’s irresponsible and an insult to people who are trying to get to work, to school or get to a hospital, it’s extremely dangerous,” said the Mayor.